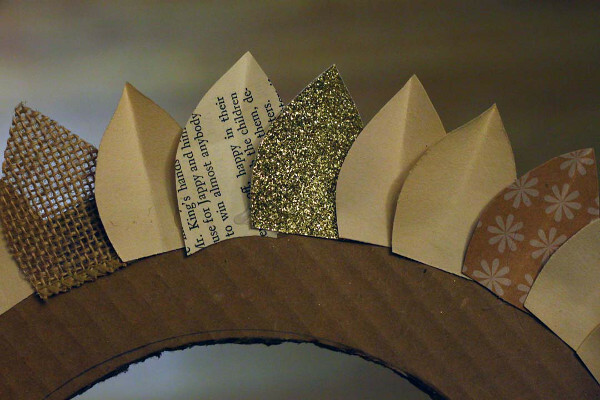 To begin, draw a wreath shape onto your cardboard, and use your utility knife to cut it out. Mine ring is 11-inches in diameter, and 2-inches wide. I traced two different-sized plates to get my wreath shape. 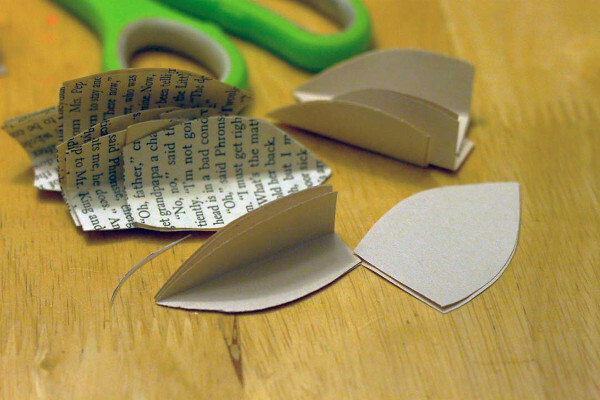 Next, cut out the small leaf shaped pattern from your PDF file printout. 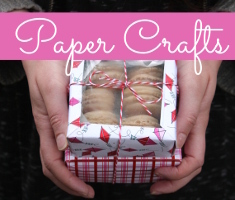 Fold your first piece of paper accordian-style so it is the width of your leaf pattern. 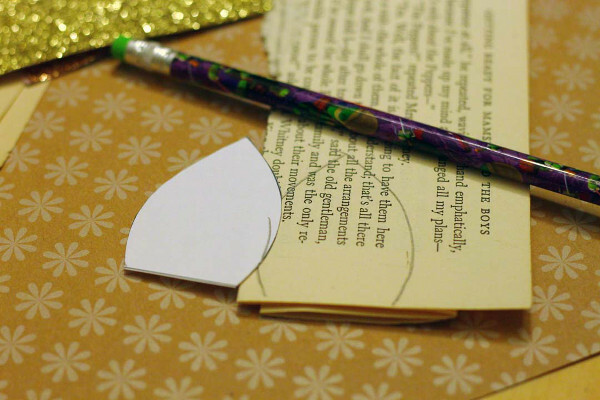 Trace the leaf pattern onto the folded paper, and cut it out–you’ll now have a whole bunch of leaves. 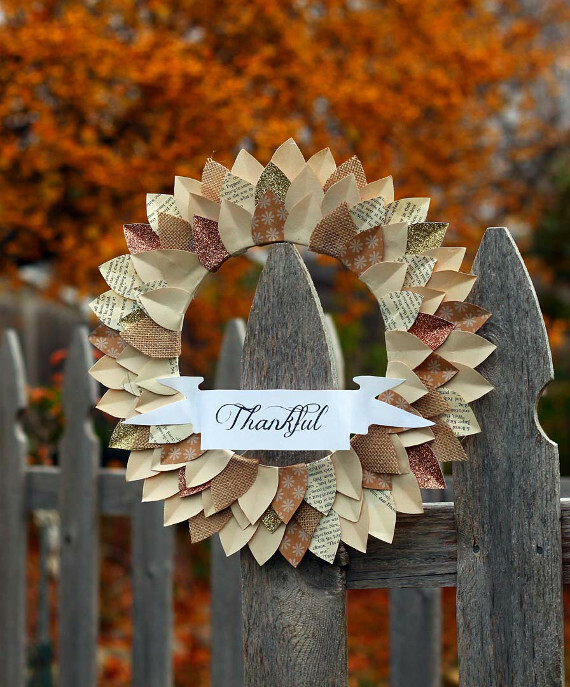 Continue cutting leaves out of all of your papers, and then out of your burlap. 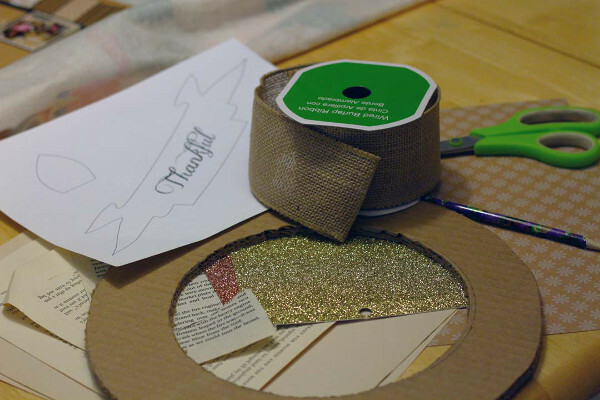 For the glitter cardstock and burlap, you’ll probably have to cut the leaves one at a time. 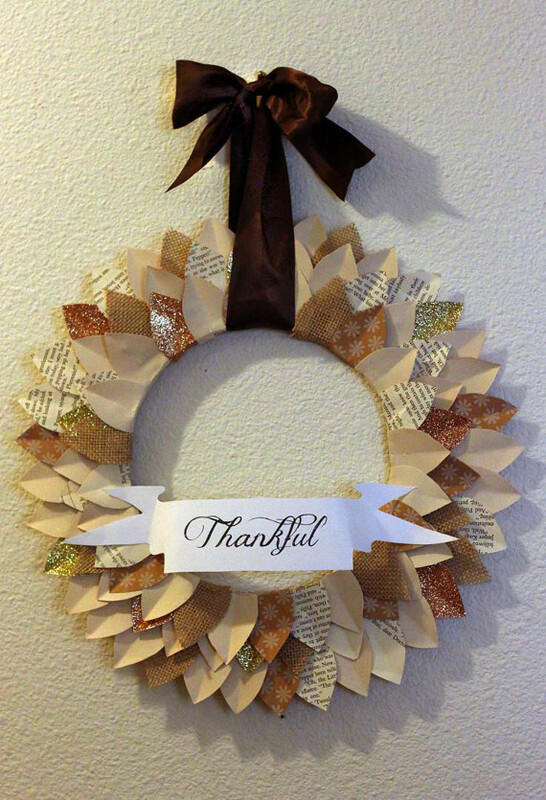 You’ll want to cut more of the various paper leaves, than the burlap and glitter ones, as they’re just accent leaves. 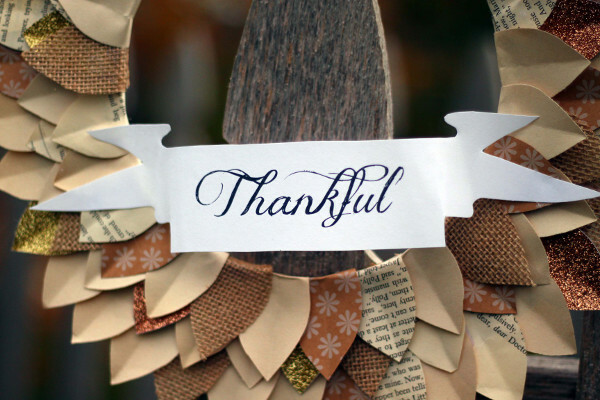 I used approximately 75 leaves cut from the various papers, and only a dozen each of the burlap and glitter ones. 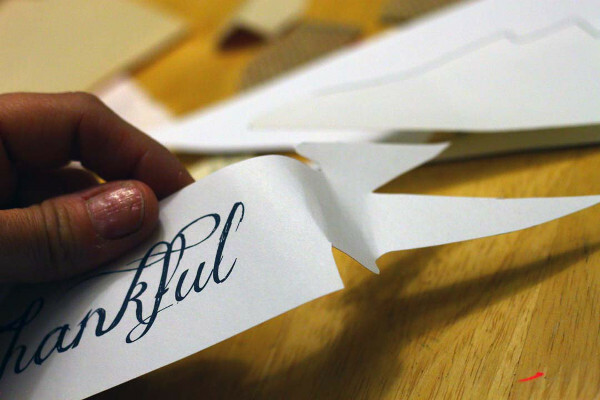 Fold all of the paper leaves in half so they have a nice crease down the middle. I suggest creasing them while they’re all still stacked up from cutting. 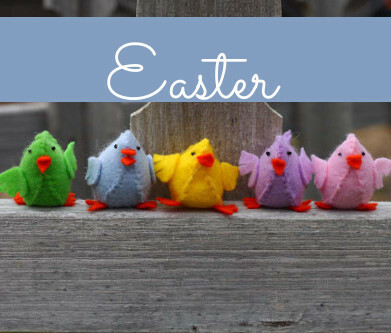 Crease the glitter leaves too, but don’t worry about the burlap ones. 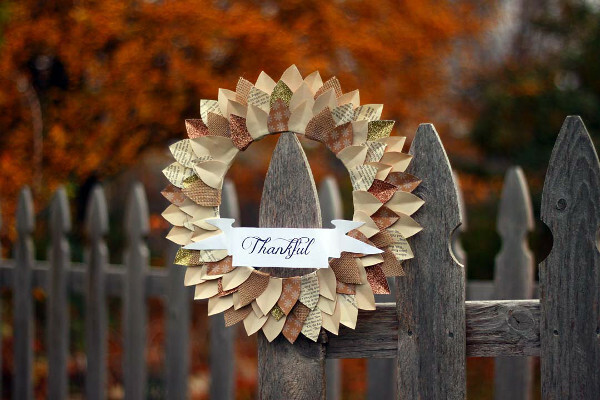 Begin gluing your leaves along the outer edge of the wreath so they’re sticking up off the edge, and as you place each leaf, be sure to overlap each one a bit. Work your way clear around the edge, and then begin a new row down below the first, overlapping it a bit as you place the leaves. 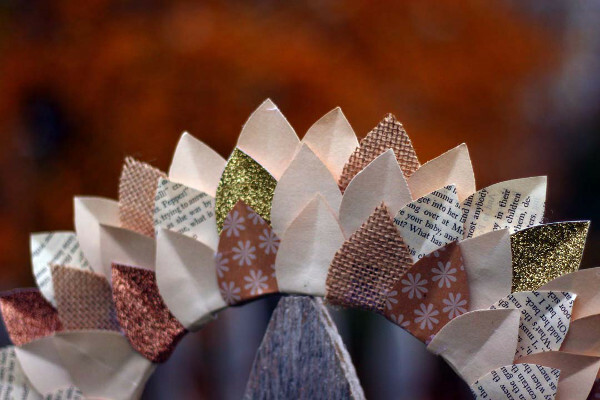 Continue adding rows working toward the center of the wreath, and ending your last row so the flat edges of the leaves hang over the inner edge enough that you can fold them down and glue them to cover the exposed edge of the cardboard. 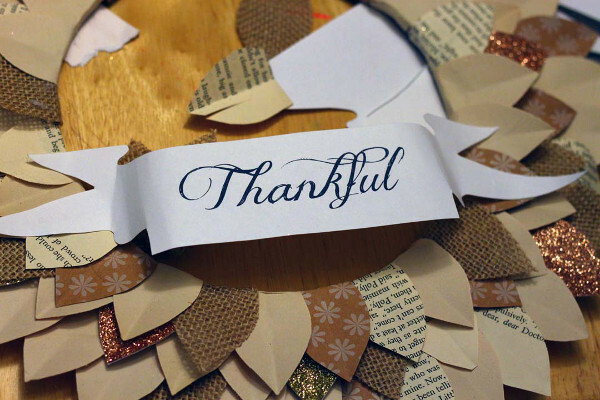 Cut out the “Thankful” banner, and gently bend the sides of the paper banner so they curve backwards, and then curve the paper tails a bit forward, to give a little dimension to the banner. 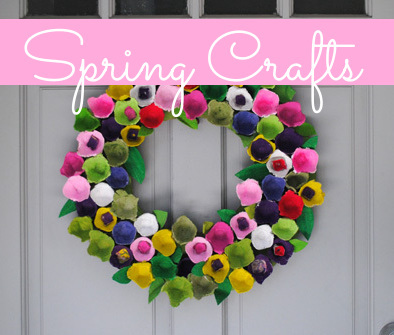 Glue the banner ends to the wreath. I chose a fairly neutral color scheme for my wreath, but you could change up the colors of the paper to suit whatever color scheme you desire. You can either glue a loop on the back to hang your wreath, or thread a ribbon through it and tie a bow to hang it with a little more flair. This is a relatively quick project to make, but the results are really quite fancy.